Jumps training overlord Willie Mullins has taken an Aidan O’Brien-esque approach to the 2018 Cesarewitch entries, but it’ll take the commander of Closutton more than this year’s seven runners to rival Silverstre de Sousa’s recent supremacy of the second leg of Newmarket’s Autumn Double. Mullins utterly dominates the Cesarewitch odds at the time of writing, with Stratum the 6/1 favourite and Limini, Low Sun and Uradel each 14/1 or shorter in the betting. Law Girl, Whiskey Sour and Meri Devie make up the remainder of a septet that means the Muine Bheag maestro will field more than 20% of the runners, even if 34 go to post on Saturday. Yet to win the 2m2f Rowley Mile marathon, Mullins will have to get the better of a jockey who’s become synonymous with the race in recent campaigns, Silvestre de Sousa. The boy from Brazil has landed the Cesarewitch odds in three of the past five runnings, three of the last four in which he’s had a ride and the last two editions, meaning he’s seeking an improbable hat-trick in the 2018 edition aboard 12/1-rated Vis A Vis. Before we examine SDS’ chances of registering the three-timer, let’s take a run through the upper reaches of the betting. 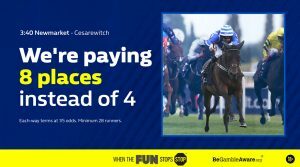 This weekend, William Hill are paying eight places instead of four when you bet each way on the Cesarewitch. Click here to place a bet on the race. Stratum 6/1, Limini 10/1, Southern France 10/1, Low Sun 12/1, Vis A Vis 12/1, Uradel 14/1, Just In Time 14/1, Stars Over The Sea 14/1, Cleonte 16/1, Here And Now 16/1, Law Girl 16/1, Whiskey Sour 20/1, Coeur de Lion 25/1, Kloud Gate 25/1, Newcross 25/1, Precious Ramotswe 25/1, Speedo Boy 25/1, Stargazer 25/1, Theglasgowwarrior 25/1, Uber Cool 25/1, 33/1 bar. Will De Sousa prove the punter’s pal (and Mullins enemy) in the ‘Ces again? SDS’ Cesarewitch successes have come from both extremes of the market, with Scatter Dice going in at 66/1 for long-time ammunition provider Mark Johnston in 2013, before successes at 7/1 and 5/1F aboard Sweet Selection (Hughie Morrison) and Withhold (Roger Charlton) in the past two years. All three carried precisely 8st 8lbs and contributed to a total of 13 of the past 16 winners having lumped less than 9st 1lb to victory. Vis A Vis is currently burdened with just 8st 9lb this time. Jumps trainers Philip Hobbs and Alan King interrupted De Sousa’s dominance when landing the Cesarewitch odds in 2014 and 2015 and this year has seen the champion jockey team up with National Hunt shrewdie Neil Mulholland’s 12/1 shot. Plucked from obscurity in France to join Mulholland’s Limpley Stoke outfit in February after one win in eight for David Smaga, the four-year-old has struck twice in two runs for his new connections. Coming over 1m6f and 2m, the latter of the two successes, which arrived by more than two lengths at Kempton in early August, has been franked nicely by the beaten horses since. 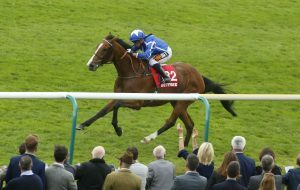 The second, King’s Just In Time, claimed handicap wins in his next two races (including the Class 2 Mallard at Doncaster’s St Leger meeting), while the third and fifth also scored in their next assignments. Just In Time is re-opposing at Newmarket and being priced up at odds of 14/1 for victory is exceptionally heartening for Vis A Vis backers. With the horse likely to carry the bones of a stone less on his back this time around and with the potential to improve again for the step up in trip, De Sousa’s agent Shelley Dwyer looks to have found the jockey a fascinating contender in the Cesarewitch betting. De Sousa’s agent Shelley Dwyer looks to have found the jockey a fascinating contender in the Cesarewitch betting. Which of the Mullins battalion represents the best Cesarewitch odds value? Favourite Stratum was clearly in the process of running a big race when meeting challenge-snuffing traffic trouble between the 3f and 2f poles in the Ebor, but, having raced 10 times on the level, he’s more exposed in this code than 12/1 pick Low Sun. Currently second in the Ricci-owned-Mullins-trained betting pecking order, he’s won half of his four flat turf outings to date, including a 2m handicap off 8lbs lower than his current mark back in late June. Raced twice since he took out a 2m7f handicap hurdle at the Galway Festival before finishing sixth over an (eyebrow-raising) inadequate 1m4f back on the level on Sunday 29th August that saw him dropped 1lb for this. Why not read our Prix de l’Arc de Triomphe predictions?